Whitney Magendie, MPH, is Senior Manager of Health Promotion at NNPHI. 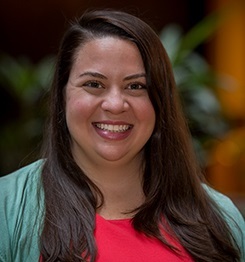 As a part of the NNPHI Convenings Team, she works to plan content for national public health conferences and serves as the planning lead for the 2017 National Conference on Tobacco or Health. Her conference planning portfolio includes the biannual COPPHI Open Forums funded by the Robert Wood Johnson Foundation, the Together on Diabetes Grantee Summit funded by the Bristol-Myers Squibb Foundation, the Preventive Health and Health Services Block Grant Grantee Meeting funded by the Centers for Disease Control and Prevention, and the 2015 National Health Impact Assessment (HIA) Meeting funded by the Robert Wood Johnson Foundation and Pew Charitable Trusts. Before joining NNPHI, Ms. Magendie worked as a development coordinator at Ipas, a global health nonprofit focused on women’s health and rights based in Chapel Hill, North Carolina. A native Louisianan, Ms. Magendie has an MPH in International Health from Tulane University’s School of Public Health and Tropical Medicine in New Orleans, Louisiana and a BA in Political Science and Romance Languages from the University of North Carolina at Chapel Hill. She is committed to implementing social justice best practices to ensure that convenings organized by NNPHI are impactful and accessible to all. Contact Whitney at wmagendie@nnphi.org or @WhitneyMagendie.